The Best Thing Since Sliced Bread…. 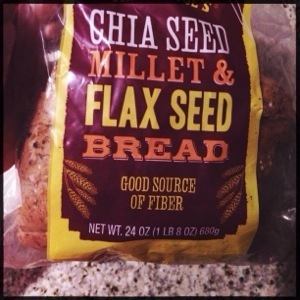 … Is sliced bread with Chia seeds. If you haven’t tried this yet, please add this to your shopping list for your next Trader Joe’s run. Chia seeds are these little, amazing seeds that expand in moisture to create a gelatinous type of bubble. I use them to make banana chia pudding, and instant oaty breakfast cups, but TJ’s used them to make bread softer. Who would have thought! Typically, “good for you breads” are non-existent or taste like cardboard. Not this one! Try it. It will change your bready life. I’m not a Catholic, but there’s something I’ve always loved about Lent. The sacrifice for 40 days, the camaraderie of everyone doing something tough together, the passion behind those who try to better themselves… even if just for 40 days. It’s like a New Year’s resolution, only without the Halmark-esque-ness about the holidays and doing something because everyone else is doing it. It’s more of a personal decision based on individual faith and the ordinance of the church. It’s neat. It’s also only meant for a 40 day period… not for “as long as you can handle it” like NY’s resolutions; which in my life, have always failed miserably. As I read though Facebook and all of my friend’s posts about what they would be giving up for 40 days, I thought about my own life and what I would give up, if I were Catholic. Then it hit me. I don’t have to be Catholic to give something up for Lent! I can join in as a human being seeking to better herself and her family and benefit from the group-mindedness of everyone else struggling through something together, but for slightly different reasons. So, for Lent this year, I’m giving something up. I’m giving up cooking dinner after work. You’re either bored by now, or think I’m odd, I’m sure, but hear me out. I work full time. I have a 1 year old son. My husband is a night student and is gone Monday – Thursday. Every night, I rush home from work by 5:30, hug/nurse my baby, feed and walk our dogs, rush through cooking dinner, get my son fed (real food), then it’s bath time, story time, and bed time, BY 7:00PM! That’s a lot to cram into a 90 minute period, and in my opinion, the one who suffers most is my son. Starved of mommy’s love and affection all day, he has to share me with the dogs, and the kitchen and the bathtub and doesn’t get to just play with me. Ok, maybe it’s me that just doesn’t get enough time to play with him. He’s growing up so quickly and I want to look back on his life and remember every detail; not just our rushed schedule. I want to remember him learning to stand on a Tuesday, and not 4 days later on Saturday, after he’s mastered the skill. I’ve heard so many other working moms say that “it’s not the quantity of time, it’s the quality of time” and I say that’s a load of crap. Who get’s quality time while trying to get so many things done in such a short period of time? NOT ME. Which brought me to another revelation. Moms like me need to “meal plan”. For the last few months, I’ve been using Blue Apron to help me master this skill, but with my commitment to not making dinner after work, I have adjusted my delivery date, so that my heavy cooking days will be on the weekend. I’m excited for my new found Lenten practices, effective tomorrow (ok, I’m 5 days late, but whatev. I’m not Catholic either). I work from home on Fridays, so Friday is an easy day to cook whatever else I haven’t used yet, which leaves us at the weekend, when my husband is home, date nights happen and of course, Blue Apron deliveries will keep my kitchen lively. If you have any great “throw it in the cooker” recipes, I’d love to try it out! After all of my research on crockpot cooking, I’ve learned that most things “need” more prep time before putting them in the pot than I have, so if you have a great recipe to share, leave it in a comment or email me (stephaniearnow@me.com).